SORRY FOR INCONVENIENCE BUT THIS PACK INCLUDE ONLY THEME! 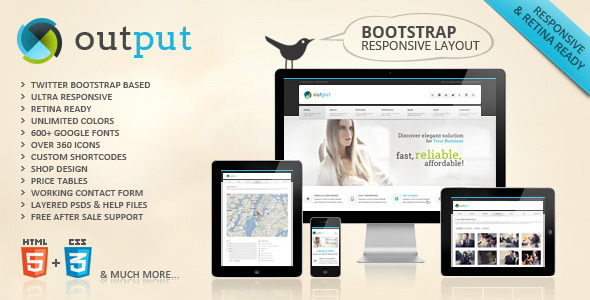 Output � Revolutionary new Multi-Purpose Responsive HTML5&CSS3 Template. This Retina Ready template comes with an absolutly new and unique Intro Page built on revolution slider that fits perfectly for this theme and emphasizes it�s sleek design. Although it�s a business theme we have added a Shop Page Design to it so you can use it not only as a business or personal website but as a design mockup for your future online store.